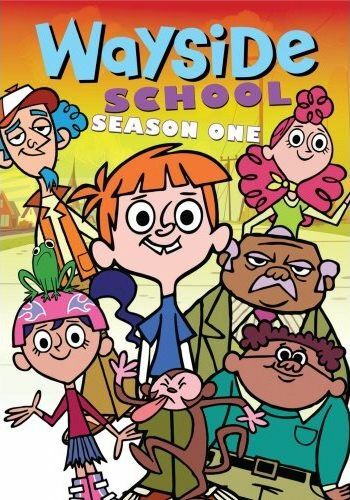 I had never heard of the animated series known as Wayside School, but being as I'm always on the lookout for new cartoons to make me laugh, I decided to give this one a shot once I learned of it. And what better way to do so than watching the entire first season on DVD. Unfortunately, it didn't strike me as one of the great series that I'll be adding to my TiVo's season pass. It was mildly cute, occasionally funny, and probably very entertaining to young children, but unlike some other shows, that's about the only level it works on. At the beginning of each episode, it is stated that the show is based on a book series by Louis Sachar, and what's cool is that this two-disc DVD set actually includes a copy of the first book in the series, Sideways Stories from Wayside School , so it's possible to compare the show to it's original source material. Both the book and the show take place at Wayside School, which is a school that was originally supposed to be thirty classrooms long, but was accidentally built sideways, so it is as wide as a single classroom but thirty stories tall. This right here sets the stage for the entire show, showing you up front how weird and wacky everything is going to be. Now, the book focuses on one child per chapter, while the television series seems to focus on one kid in particular among the thirty students, and that is the new kid named Todd. Being the new kid, Todd also seems to be the straight man in a school full of weird and nonsensical characters. And for some reason, he always seems to get dumped on. What do I mean? Well, the girl in the class that has a crush on him shows her affection by constantly punching him. And every time he tries to help or do the right thing, their teacher, Mrs. Jewls, ends up misinterpreting something and putting his name on the board in the DISCIPLINE box. I actually got kinda ticked off at that. I know it's supposed to be funny, but what kind of message is that sending? If you be good, try to help people, and do the right thing, then you'll get in trouble, but if you act stupid and crazy then you'll be fine, just fine, and everyone will like you. There were some parts I found funny, however, such as this one girl who loves rules and is always smiling and giggling and then out of nowhere will just yell ENOUGH! And then there's the principal, who can't remember Todd's name, so always calls him by his address. Every character has their own weird quirk, such as the kid that always sleeps in class or the kid that always wears his Halloween elf costume to school, and these are amusing, but that's about as funny as it gets. The stories are simple and crazy, with not much of a plot to speak of, and each half-hour show is broken down into two fifteen minute episodes. There are no extra features on the disc, but as I said earlier, an actual copy of the first book in the series is included, which is really nice. The humor in the book is on par with the series, so they actually did a pretty good job of adapting it. I think I actually prefer the book to the show, however, and I'm sure a lot of the reason why is because in the book Todd doesn't get beaten down every chapter. Still, I'm sure young kids probably won't care about that.